I like the blue polka-dots! Is Mr Tumble in Copehagen! Is it the perfect bike, because the colors fit; (or was it the perfect moment) once, the shoot has been taken. I would say both – it was the perfect moment, and the colors fit!. I’ve heard Europeans exercise more than many Americans. There may be fewer people with problems of obesity & related health complications. It looks like it’s in excellent condition, & I just noticed, there’s no chain locking it to the railing! They must not be concerned about theft! 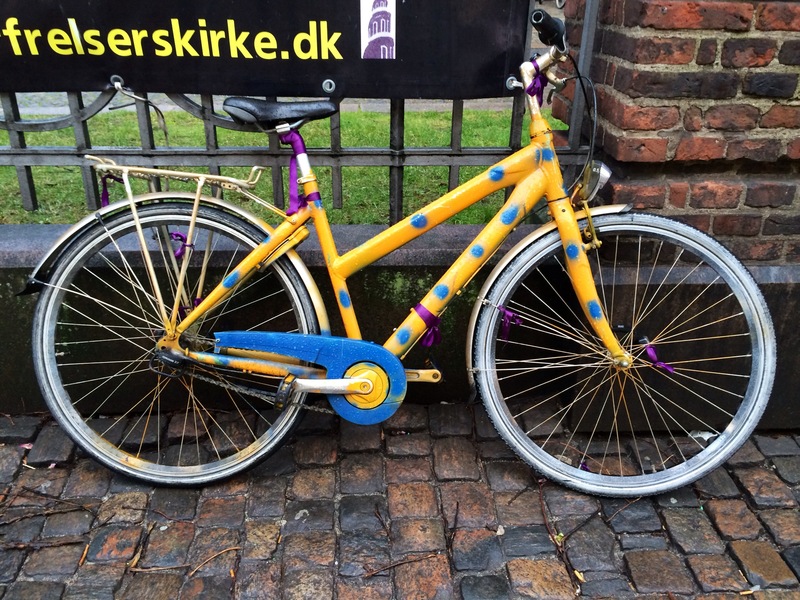 It seems all of the bikes in Copenhagen are unlocked! I like the cobblestones too. The environment appears very clean & unpolluted. The colors on this bike remind me of colors a little kid-(especially a girl)-would like; not to sound like I’m stereotyping. Is Copenhagen a small place? Una Bicicleta del Cadiz Gitana !!! love that bike wish i had it! but unfortunately i don’t stinks doesn’t it!